Lunar New Year is about family reunion. What better way to bring the family together? Yes, you guessed it. Food. Other than the yearly favourite - Prosperity Burger - McDonald's is also launching a new Golden Treasure Chicken Burger, which consists of a grilled chicken patty topped with caramelised onions, lettuce and umami – mushroom slices (ala carte from $6.30), all in one bite which offers up a sweet, savory, spicy and tangy mix! The new Golden Treasure Chicken Burger will be served from 18 January 2016, alongside the Beef and Chicken Prosperity Burgers (from $5.30) and Twister Fries (from $3.20) while stocks last. To complete your meal, opt for the Golden Treasure Feast (from $8.90) which includes a choice of either the Golden Treasure Chicken Burger, Beef Prosperity Burger or Chicken Prosperity Burger, with Twister Fries (M), Pineapple Nata de coco Pie, and to end the meal, Yuzu McFizz – a refreshing Yuzu-flavoured drink with a colourful burst of jelly balls. And really, who has got time to queue up anywhere during this festive season, right? You can have it fuss-free, by calling McDelivery! A wide selection of bundle meals are available 24/7 with their McDelivery™service! What bundles are available? Here you go! On the side, here's a tvc which they launched for the festive season. Okay, I realised that that smart kid at the end still did not get an angpao (red packet). No cash, but still got love. Priceless okay? But we can see how bright his future is in the creative line; his thinking-out-of-the-box skills are still awesome! The lighthearted ad, of course, focuses on family and that's really what Chinese New Year is about: Family. And when you think about family, what else do you think about? YES - Red packets lah! Don't be shy to answer leh! 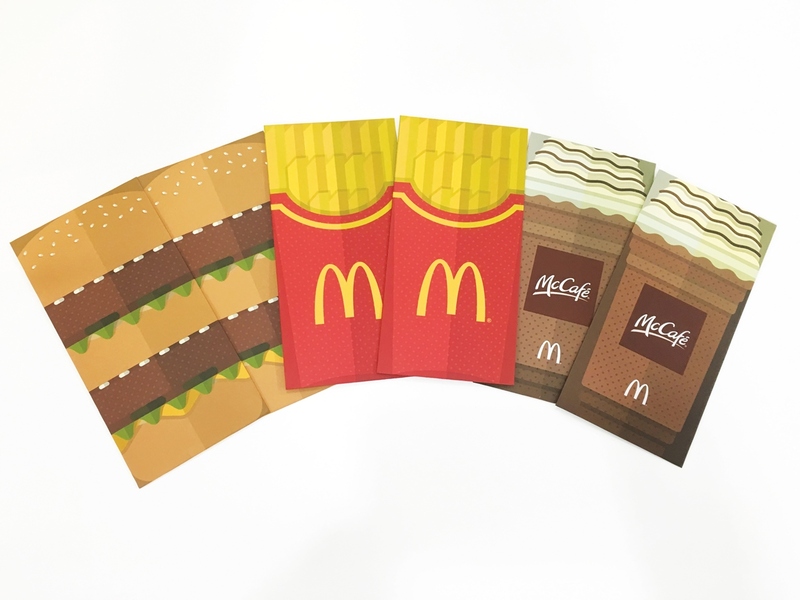 And what better collectible for the McDonald's fanatics other than McDonald’s Exclusive Red Packets? For a limited time only, you can redeem a pack of McDonald’s exclusive red packets with every purchase of a Golden Treasure Chicken Burger Extra Value Meal. This promotion will be available from 21 January 2016 at all McDonald’s stores in Singapore, excluding Nanyang Poly, NUS, NTU, Singapore Poly, Temasek Poly, McDonald’s self-ordering kiosks and McCafe. Redemption is valid only while stocks last.